Roger Federer has given a surprising reaction to Nick Kyrgios' commentary of his match after dispatching his third round opponent, American young gun Taylor Fritz, in straight sets, 6-2 7-5 6-2. 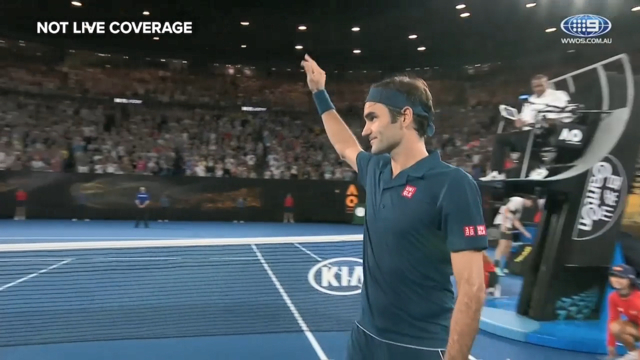 Making his debut in the Rod Laver Arena bunker for Channel Nine, Kyrgios fawned over a dominant Federer throughout, on several occasions pointing out that he considers the Swiss to be the greatest player of all-time. After being made aware of the polarising Aussie's new role and his kind words for the world number three, Federer gave a glowing response which included his observation that the 23-year-old is "very passionate" about tennis - a comment that is at odds with some of the things Kyrgios has said when asked if he loves the game. "Nick’s a really sweet guy, I love the guy. I’m happy to see that he’s commentating because he’s very passionate about this sport, you know, and I love watching him play and actually so many others, I’m a big tennis fan," Federer said. That comment came amid an answer that got the biggest roar of the crowd that sat enthralled by a long and insightful interview with one of Kyrgios' co-commentators for the match, American legend Jim Courier. Generous with his time and thoughtful with his answers as always, Federer shared his feelings about playing in front of his young family and gave his take on a growing wave of young stars emerging to attempt to knock he, Rafael Nadal and Novak Djokovic off their perch atop the tree of men's tennis. 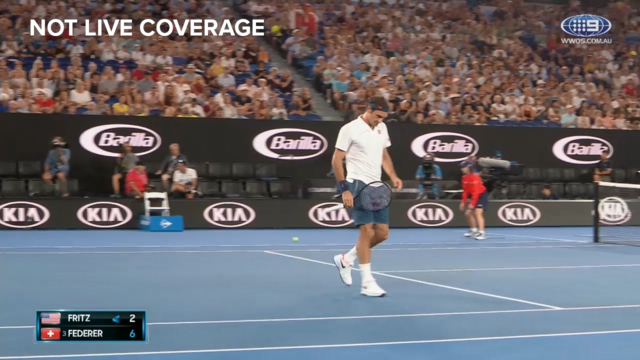 While there was plenty of cooing from the crowd, it broke out into rapturous applause when Federer gave his response to a question about whether he "cared" about what other current players like Kyrgios thought of him. "Yeah, I care what they think. I don’t want to say you try to create an aura for yourself but you earn respect," Federer said. "Maybe it’s as simple as that, that they know when they’re down in the score that it will be really hard to come back and they know when they’re up in the score that probably I’m going to mount a comeback, so you work for that.
" ... Men and women’s tennis, I watch everything. So I do care what the other players think and I think a lot about the other players too." Federer was in good spirits with good reason after playing some of his best tennis of the tournament so far in a warning shot to the other contenders attempting to rip the Australian Open crown he's worn for the last two years off his head. His demeanour and his performance was in stark contrast to his second round match in which he often seemed agitated in a long struggle against British player Dan Evans. Federer broke Fritz's first service game of the match and, other than for part of the second set, never took his foot off the 22-year-old's throat as he glided around the court and pulled out his full repertoire of shots. At one stage he even won a point with the SABR (surprise attack by Roger) which Kyrgios claimed in commentary that Federer had "stolen" from him after he invented it in juniors. "Roger didn't create the SABR, I did and he stole it," Kyrgios said, light-heartedly after exclaiming, "when Federer gets to the front he's almost impossible to stop. It's a difficult one, you just do anything he hasn't seen before and he's seen everything." While Kyrgios and Fritz are two of the youngsters to be bundled out of the draw, Federer's next opponent is highly rated 20-year-old Greek star Stefanos Tsitsipas, a match the 20-time grand slam winner said he was excited about. "It’s not easy to come through but they’re doing great and we saw with (22-year-old Karen) Kachanov winning Paris at the end of the year and (Alexander) Zverev winning the World Tour Finals, they’re definitely knocking on the big stage," Federer said. "It’s a different generation of players, they grew up with different string technology, different racquets and different coaches were also part of that wave so it’s not so much volleys anymore as we see it but my next opponent he likes to come to net, Tsitsipas, and I like to see that so I think that will be quite interesting."